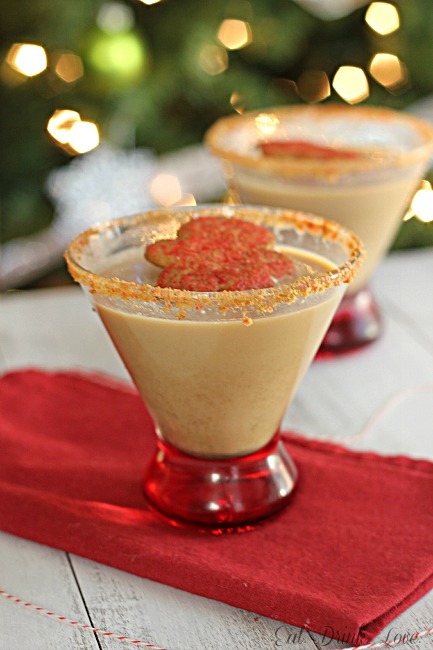 Gingerbread Martini - Eat. Drink. Love. Everyone has a certain flavor that reminds them of Christmas. For some it’s eggnog, for which I am still just not so sure how I feel about. For others, it’s peppermint. Speaking of peppermint, I have a confession. I think it’s time I come clean about something. We’re all friends here, right? Ok, here it goes…I don’t really like peppermint. I know, I’m sorry. Please don’t throw garbage at me. I don’t HATE it, I just don’t really care for it. I only like mint flavor in a few things: toothpaste, gum, tea, mouthwash, mint chip ice cream, and..well, that’s about it. I don’t like peppermint bark either. This is also because it contains white chocolate, which, by the way, I really do hate. My favorite Christmas flavor is gingerbread. I’ll skip the peppermint, just give me the gingerbread. In all forms. Cookie, latte, and now, martini. And just a warning, this thing is dangerously addicting. 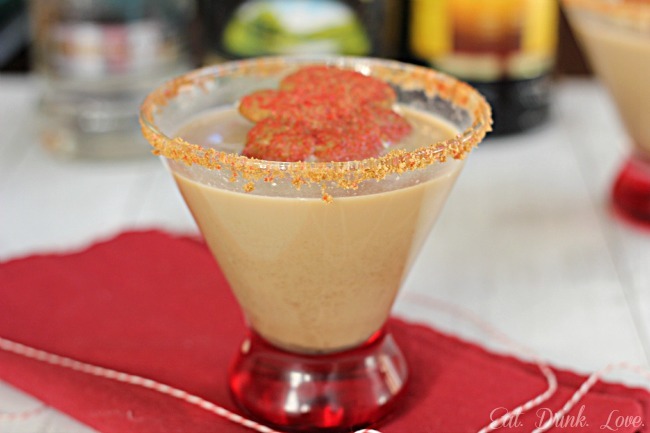 The gingerbread syrup is really where it’s at with this drink, so add as much or as little as you like. I kind of want to pour the syrup on everything though. In a small saucepan, heat the water, brown sugar, molasses, ginger, and cinnamon on medium heat until the sugar dissolves (about 5 minutes). Crush about 2-3 small gingerbread cookies in a zip lock bag with a rolling pin. Place the crumbs in a saucer and set aside. Pour the 2 tablespoons of half and half into a small saucer. Dip the rims of the martini glasses into the half and half. 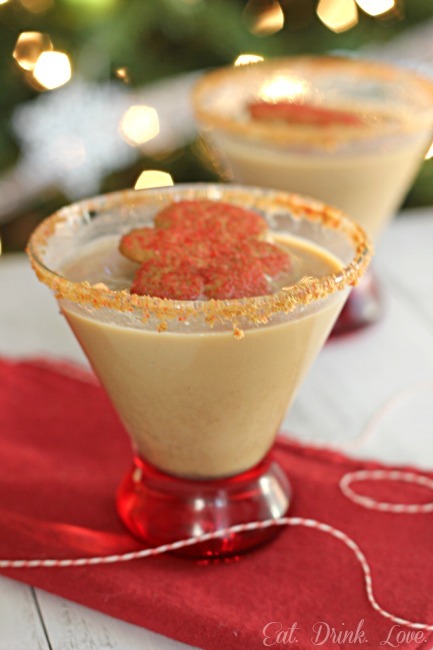 Then dip into the gingerbread crumbs and set the glasses aside. 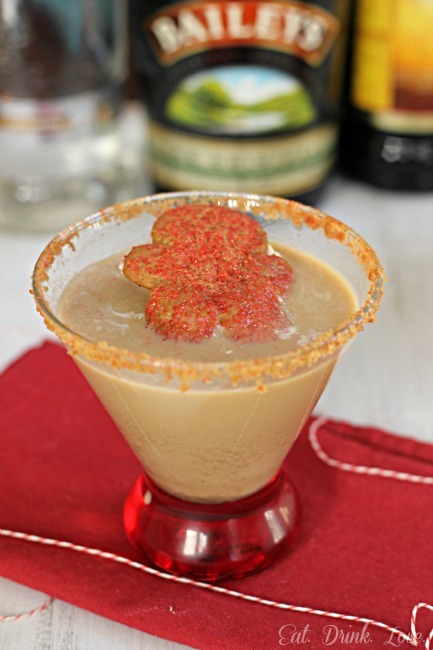 In a cocktail shaker filled with ice, combine, the vodka, Kahlua, Bailey’s Irish Cream, gingerbread syrup, and the half and half. Shake well and pour into martini glasses. 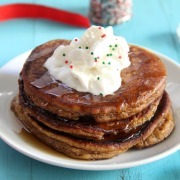 Place a dollop of whipped cream on top and then place a gingerbread cookie on top of the whipped cream and serve. If you can’t find gingerbread cookies, you can also use gingersnap or Biscoff cookies. What? You don’ t like peppermint? Your crazy!! 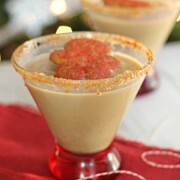 lol I am so loving your Gingerbread martini!! Loving the Kahlua and Bailrys in it!! 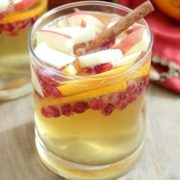 Perfect holiday drink!! My hubby doesn’t like mint either…except in toothpaste! What a festive martini! And the gingerbread man garnish is perfect!!! 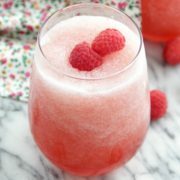 What a delicious looking cocktail. Those would be irresistible! to each their own! definitely won’t throw stuff at you for not liking peppermint :) this martini looks fab! Ooooh how fancy! Love these! Oh mama. I want 10 of these. I need one of these right about now..Looks awesome! Oh my these look gorgeous and delicious! I need me a virgin version asap! I don’t care that it’s 8:45 in the AM. I want one now. This martini looks amazing! I love the gingerbread man floating on the top- nice touch! I can’t wait to try this recipe. Pingback: Gingerbread Recipe Roundup - Eat. Drink. Love.